Have you ever had one of those projects that you completely forgot about it and it has a deadline? Well you don't completely forget about it. Maybe you just don't put it at the top of the priority list. It's still really important but you just got...squirrel! You know, something like that. Luckily for me, while moving my piles around, I uncovered the tote this was hiding in and remember it. Above are signature blocks members of the guild signed for a secret project that I agreed to turn into a wall hanging. My dead line is June, but I want to be finished way before then. Quilter's good intentions...wink, wink. Hopefully, I will have them all sewn up before the weekend ends. Last weekend I warned that there might be lots of pictures from the WV State Archery Tournament. There won't be many, because I was so on edge watching the shoot, I forgot to take pictures. 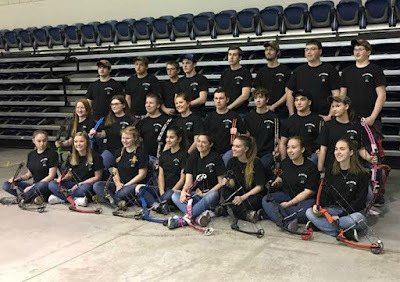 Our high school team was ranked first going into the shoot. Our elementary and middle school teams both placed first in their divisions and will be headed to Nationals in May!!! Unfortunately, the high school team didn't place. Jen still did very well, but missed placing as an individual by one point. The competition was very close. 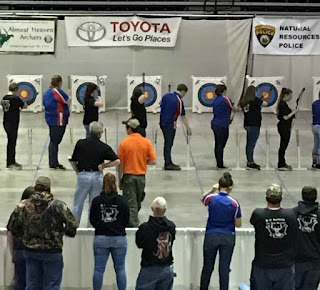 However, she still shot the best she's ever shot at the state tournament and was our teams top shot girl. Both goals she's worked very hard to achieve. Missing by one point makes her our little unicorn...she does love unicorns. We are extremely proud of her and her team mates! Next year guys, next year. 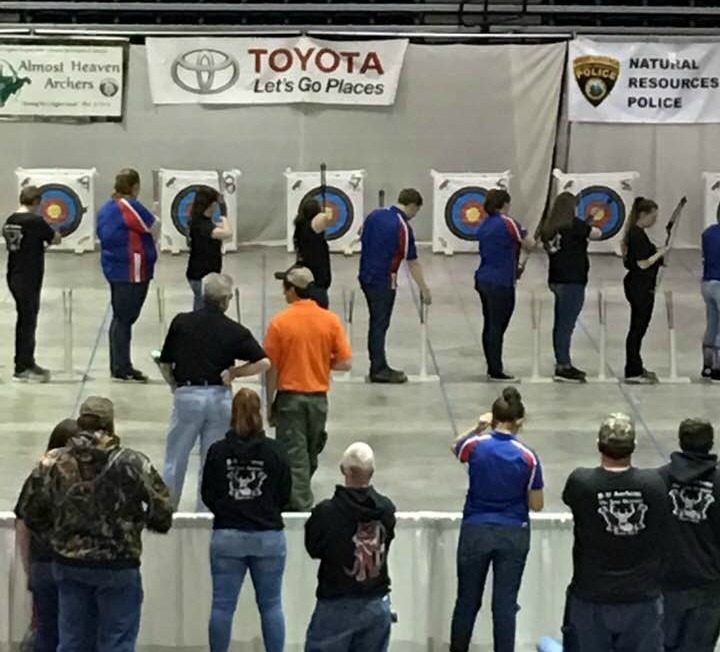 Jen is the really short one in the middle of the picture with her bow up to shoot. So with all the travel last weekend, not much sewing happened in our house. I wanted to share with you David's current project because I am in LOVE with it. He's calling it Fractured. It's made up of batiks with some hand dyed fabric (made with the help of Julie) and it's just gorgeous. He started off by using Liz at Savor Every Stitch's Haphazard random HST generator (she also has one for squares and rectangles). A very cool app for creating this style of quilt. If you've never played with it, please take a few minutes to give it a go. Liz, your a genius, thank you for sharing it with us! After he had a general idea of how many HST's to make and a basic layout he got to work. Once his pile of squares where finished, he played around with the layout some more and this is where everything fell. He's quilting it now, so I can't wait to see it finished. So what were you guys up to last week? Let me show you. Chris at Chris Knits, was busy finishing up a fun table runner for Easter. She started this little project before taking a vacation and got right back to it after the fun in the sun was over. I think that deserves some recognition. I know I have a bad tendency after a break to not go back, just start a new project. But, Chris hopped right back to it. Now she has this bright fun piece to share with her family just in time for the Easter holiday! Egg-celent job, Chris! I also wanted to mention Wendy at Pieceful Thoughts of My Quilting Life and her Lost Woods Batik Table Runner. 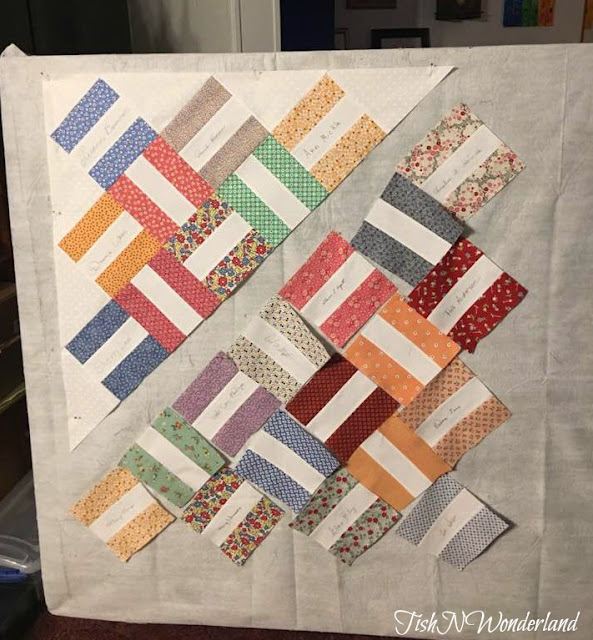 She pieced this beautiful table runner using left over blocks from another project. I know those spinning strips brings back many childhood memories of playing in the woods for me and seeing the trees gently blowing above your head. I applaud Wendy because after piecing them together she had to make a decision; table runner, bag or pillow? I know for me, I can waste a whole lot of time with debates like this, or even abandon a project because of it. Wendy, made the decision of table runner and quilted on. I'm going to take a lesson from this and just keep quilting myself. Congrats on your beautiful finish, Wendy! So now it's your turn. What have you been up to this week? 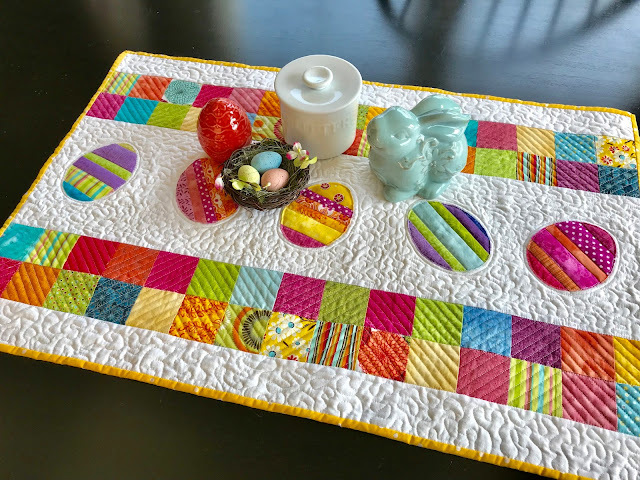 Are you looking around your sewing room for your abandoned projects like a toddlers on an egg hunt? Or maybe you are stashing them in corners like the exhausted parents, praying that the kiddos find them all later. Whatever the case, link up! Let's celebrate some finishes and cheer each other on as we sew toward finishes. Last weekend sounds rather intense, and I can tell you are all really looking forward to next year already. I hope you have the mini quilt pieced quickly this week, and I agree that it's been fun to watch David's progress on his latest project. I love Liz's random generator! I haven't made anything from it (yet) but it is so fun to play with! I can understand being on the edge of your seat and not taking a lot of photos. I had never heard of Liz's Haphazard random generator and had to go check it out, I hope I don't end up chasing a squirrel. And literally while I was posting that last comment, my email binged and it was Liz! I was so excited to send her the link to this post so she could see Dave's piece. Wow I'm so excited to see someone make a quilt from Haphazard! It looks amazing and the colors are not ones I would ever have thought would work but they really do, it looks stunning! 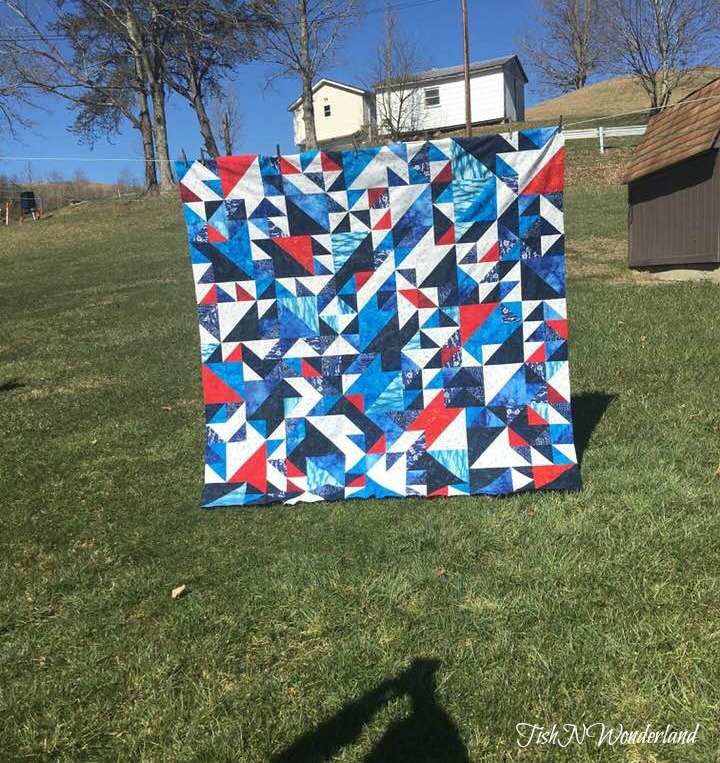 I can't wait to see the finished quilt. At least you found the project before the deadline LOL Good luck. 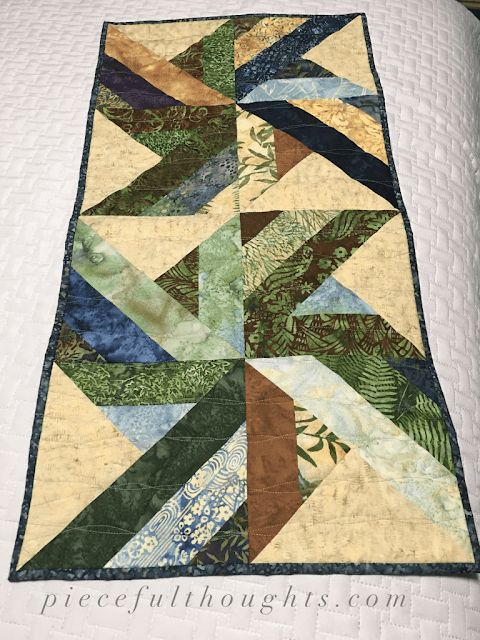 I really like the Fractured quilt. I need to look into that app. Aren't you glad you looked into that tote?!?! Nice post, Tish. 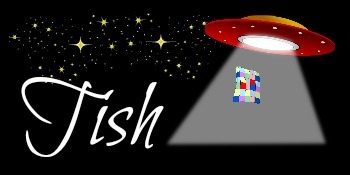 I actually read it yesterday, but fell down the rabbit hole following all of your links! You must be so proud of your daughter. Archery, of all things! I thought it was a lost art! I remember being introduced to it at summer camp when I was just a wee thing. I remember lots of bruises inside my elbow, too! I was never meant to channel Maid Marion! But your daughter has nailed it! Man, I do that pretty frequently, losing track of the timeframe I want to do a project in. :) Archery seems so exotic to me, and I do wish I had time to pick it up - they've added it to our annual Taekwondo tournament. Congrats to your daughter! Sounds like she's on her way to more expertise.